If you ever felt like you’d like to take an 18-year-old game and then dial the clock back on it even further, then a team of Grand Theft Auto modders have come up with just the thing. Grand Theft Auto 3D is a mod aiming to recreate GTA III in order to recapture what the game looked like before it was actually released. 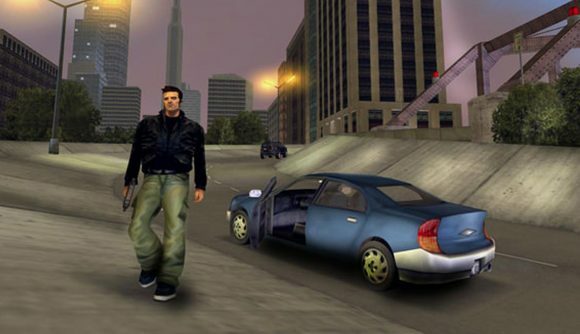 The idea behind the mod, which was released earlier this month, is to take the launch version of GTA III, and incorporate as many assets from the game’s early development as the modders could get their hands on. The original HUD is back, and the art style has been replaced to make it more similar to GTA I & II. Liberty City has also had something of an overhaul – many larger buildings have disappeared, replaced in some cases by smaller structures. Elsewhere, those towering skyscrapers are just grass. The city’s emergency vehicles have also been reverted, undoing last-minute changes made to the game in the wake of 9/11. Silent protagonist Claude has seen some changes too – the character went through several iterations before release, but modders have now dialled back the clock on him as well. You can check out the trailer for GTA 3D, complete with some questionable driving – in the video below. If a cosmetic demake doesn’t do it for you, you might also like to know that the mod tweaks several other aspects of the game, including vehicle handling. You can download the mod from gtaforums. Sadly, it does more or less remove all missions from the game, at least for now, so it won’t be much good for a full playthrough.